I don't know about your, but I simply can not afford to buy all the fancy, wonderful toys needed to do any major art or craft project! Additionally, I feel personally obligated to try and re-use (ie, recycle!) anything I possibly can. 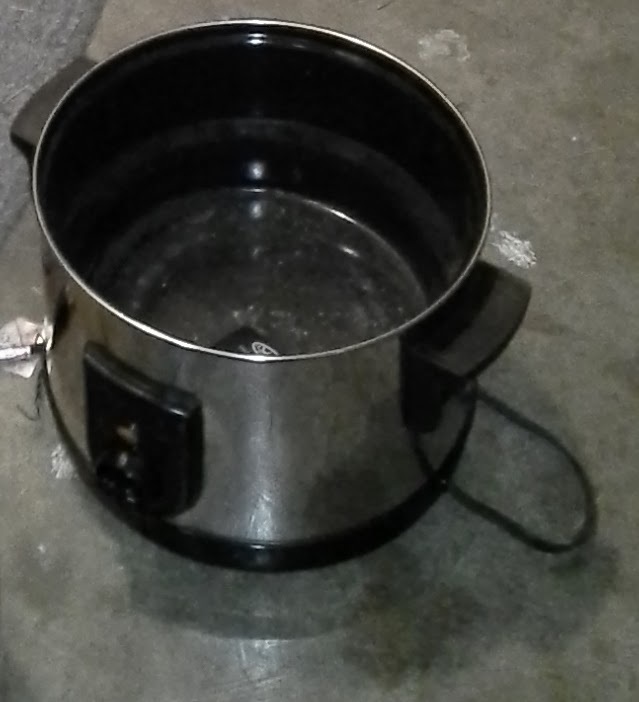 So to support and maintain my own personal intergrity, I have decided to make my own steamer apparatus for steaming silk paintings. I mentioned in the previous post that I LOVE, ADORE, AM ENAMORED WITH, (etc) silk painting. And one of the best tools you can have (in my opinion) is a steamer. Professional-grade steamers cost hundreds of dollars (way too much for my sad little wallet!). And I know I could use the stovetop and a steamer basket - that seems somewhat risky to me and I don't want those dyes etc in my kitchen. SOOOO... I took a page out of my friend Barb's page. She made her own - and it works GREAT! I thought 'how hard can that be?' (of course it's ALWAYS harder than I plan on!!). First I found a rice cooker at my favorite thrift store. It cost me less than $10 (maybe even less than $5 - I can't remember the exact amount, but it was a good price!). And it has a variety of settings which I tested at home... several of which boil water very nicely. I just need to play with the settings once I'm ready to actually steam something. Next I needed ductwork/pipe. It's OFFICIALLY called Galvanized Duct. I ended up buying a 5 ft piece with a 10inch diameter. I think Barb's is 2, 2ft pieces joined together with another bit of ductwork - so hers measures 4ft in length. (I didn't want to mess around with trying to join 2 pieces together - I figured I'd have enough problems making the thing without complicating it more). 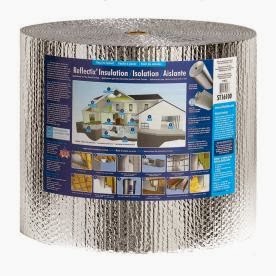 I bought some nifty insulation (which looks like bubble-wrap and is fiberglass-free) called Reflectix Insulation... I bought it in a narrower width (so it was less-expensive) and I think it was 25ft long. There's PLENTY on the roll to cover my steamer at least twice if I want to (I'm starting with one layer for now - I may create a removable blanket to use as a 2nd layer if I need to better-insulate it). 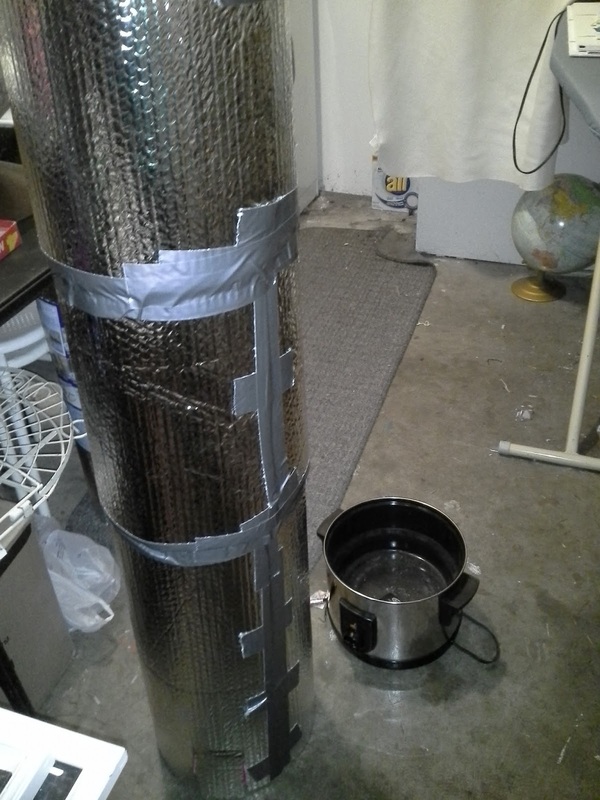 So there were 2 major obstacles for me - 1) putting the duct/pipe together (it came as a rolled sheet and I had to have help to join the sides together to form the pipe) and 2) getting the darned pipe to fit in or around my rice cooker. The ducting has 1 end that's ribbed and seems like it SHOULD squeeze into a smaller-sized item (but it didn't until I used the metal sheers to cut some of the ribs all the way around the duct/pipe). Once I cut the ribs, I was able to bend the ribbed portion in order to fit it into the rice cooker. Unfortunately, the duct/pipe did not balance firmly on the cooker even with the ribbed portion shoved inside the cooker. SO to help stabilize the duct/pipe, I added 4 metal, flat-brackets to the outside of the pipe - so that they attached to the duct/pipe right above the upper rim of the rice cooker. Once those were added, when I slipped the duct/pipe into the rice cooker the flat-brackets act as flanges/stabilizers. FYI - I also cut a square hole in the duct/pipe where the duct/pipe and rice cooker join. I re-attached the cut-off piece with a screw and a couple of washers and a nut... so I can keep the duct/pipe sealed but spin the cut piece to the side and use the hole to add water to the rice cooker if I need to. 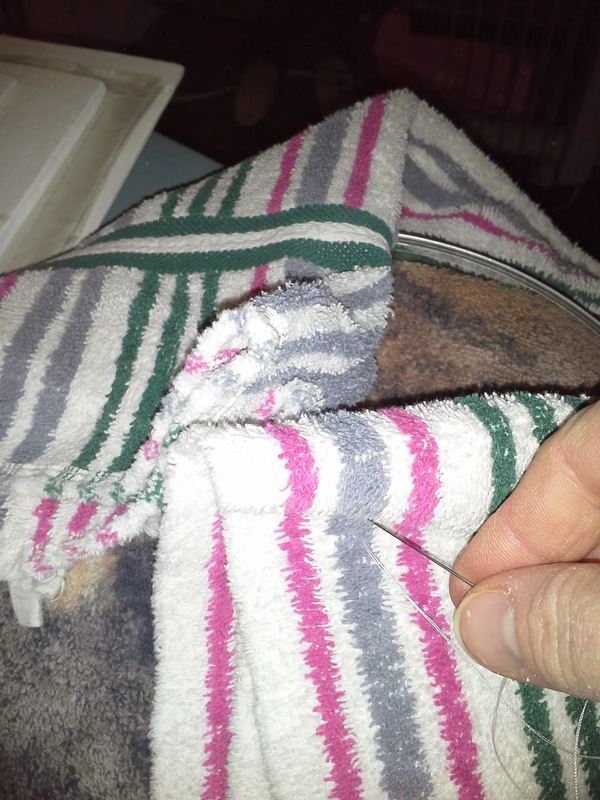 I also drilled a small hole about half-way up the duct/pipe so that I could stick a thermometer into the hole and check the temperature inside the steamer (my understanding is that the temperature needs to maintain a temperature of around 212 degrees at all times while steaming dyed silk). I also sealed this hole up with a removable patch. 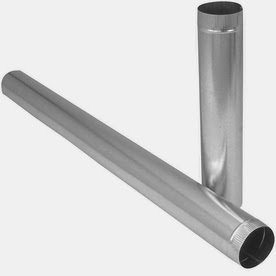 My final cuts to the duct/pipe were two notches in the edge of the pipe (at the top of the duct/pipe accross from each other) so that I can lay a piece of wood into the notches and not have the wood fall out. I will be hanging a cloth-bag containing my dyed silk pieces from the wood - it's important that the wood not roll or move because you do NOT want the silk (nor the bag containing the silk) to touch the sides of the steamer... the moisture could ruin the artwork . 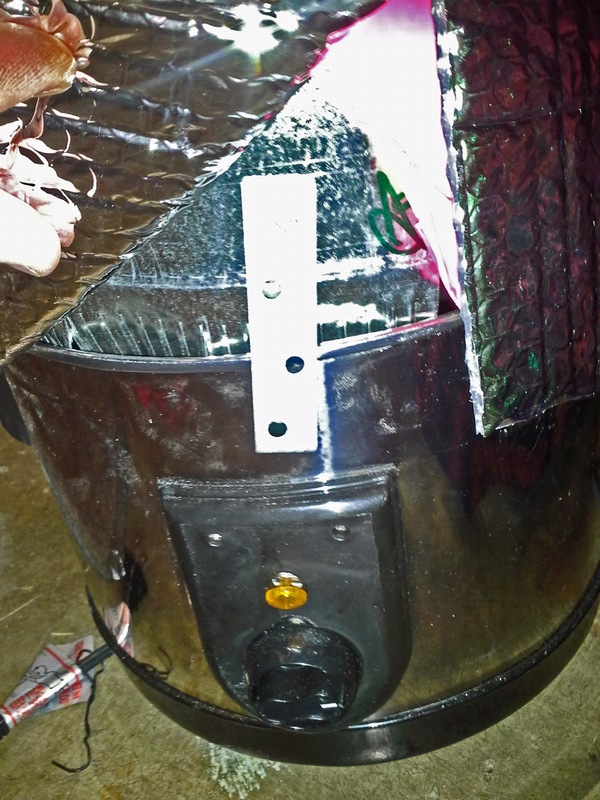 Once I had the duct/pipe fitting into the rice cooker and nicely stabilized, I covered the duct/pipe with the Reflectix Insulation using duct tape to join the sections of Reflectix together. I made sure to cut holes in the Reflectix for the thermometer and at the base for adding water to the rice cooker. Next I took the lid of the rice cooker and placed several towels around it - and hand-sewed the towels on... so the lid won't fall out and the towels will stay on. The towels are there to help seal-in the steam, and to absorb moisture so that there are no drips falling back down on top of the silk as it steams. My last job will be to make a long cloth bag to hold the dyed silk and which will hang inside the steamer. I'm estimating that it should have a diameter or no more than 4 inches. It will be closed at the bottom end and have a draw-string (and maybe a protective flap) at the top. carefully roll the artwork/newsprint around the dowel making sure not to wrinkle anything. once rolled, tape the roll together so it can not come undone. place the roll into the steaming bag, once inside the bag - remove the dowel. close the bag and hang carefully from the wooden cross-beam on the top of the steamer apparatus - making sure the bag does not touch the walls of the steamer! 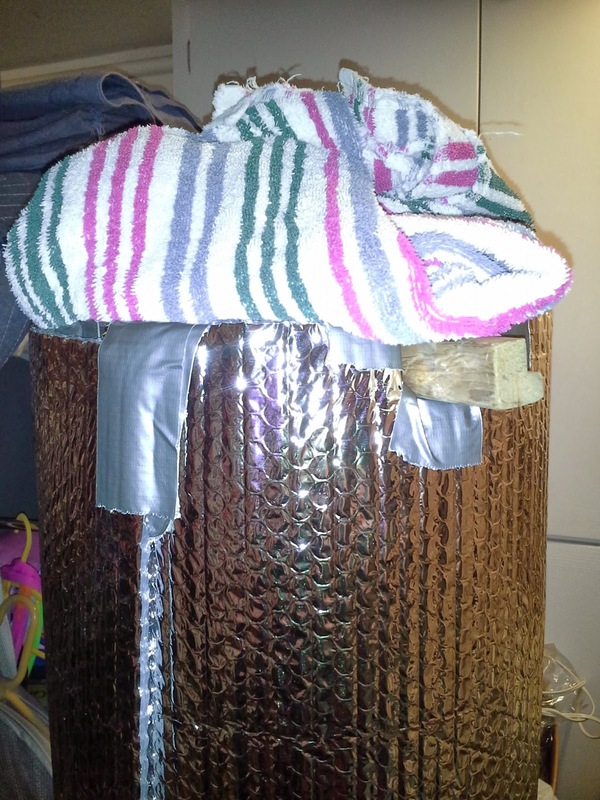 place the towel-covered lid on top of the steamer. turn the rice cooker on to the appropriate setting for a low boil. let steam for a while and then check the temperature of the steam in the pipe. Make sure it's 212... if not, turn the rice cooker up higher. DO NOT LEAVE THE RICE COOKER UNATTENDED!! Once your silk has steamed, turn the rice cooker off and let it cool before removing the silk. You may want to test for color-set.. if it's not set, you may need to steam your silk further. Has it been a lot of work creating my steamer?? YES!!! It's taken quite a bit of work to get (what I hope to be) a working steamer!! But I'm rather proud of my creation - and the fact that I've used a recycled rice cooker and recycled towels to help construct it. Best of all, the whole thing is costing me less than $50 bucks (probably closer to $40!! ).